alaTest heeft 40 reviews verzameld en geanalyseerd voor Vizio VTAB1008. De gemiddelde beoordeling voor dit product is 2.9/5, vergeleken met een gemiddelde beoordeling van 4.5/5 voor andere producten in dezelfde categorie. Reviewers waarderen het gebruiksgemak zeer maar velen zijn minder positief over het scherm. De draagbaarheid is ook indrukwekkend. We hebben de consumenten- en expertbeoordelingen, de leeftijd van het product en andere factoren geanalyseerd. Vergeleken met andere producten in dezelfde categorie krijgt de Vizio VTAB1008 een alaScore™ van 81/100 = Zeer goed. This nameless tablet isn't as impressive as its 10-inch Vizio counterpart. The Vizio Tablet VTAB10008 wins points for originality, and adds some clever remote control functionality, but it's not powerful enough to compete with the best tablets out there. Inexpensive. Universal remote capabilities. Good-looking Android customization. Three speakers. 4:3 aspect ratio makes device usable in both orientations. Underpowered and laggy. A bit heavy. Display has poor viewing angles. Only 2GB of internal storage. 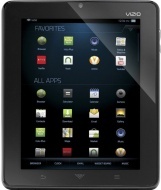 The Vizio Tablet VTAB1008 stands out from the crowd of Android tablets with its unique size, customized interface, universal remote control capability, and affordable price. Vizio's tablet isn't the thinnest, fastest, prettiest, cheapest, nor the most up-to-date tablet we've seen, and the viewing angles on its screen aren't great. The Vizio Tablet makes a great competitor to 2010's Samsung Galaxy Tab, but lacks the grace, speed, and features of today's best tablets. The lightweight tablet matches its fast processor with a super high definition resolution. "Great product for the price (much cheaper than iPad)"
Cheap (paid 170 at Sams Club in 2011), Connects to Google Play app store (not some 3rd party app store), Access email (gmail, aol, etc), YouTube videos, Pandora (music), Flash-based games, Books, Connect remotely upload your own books and reader app. Difficulty with wi-fi wireless network connectivity, Charging port is prone to breaking. User must not manually update Adobe Flash. "This tablet is a great work of art." camera could take better pictures! Started having problems with Charge Port after just 4 months. Started to feel loose and then would not connect properly. Eventually stopped connecting and could no longer charge. Screen turned gray and just stopped working. AFTER 4 MONTHS.